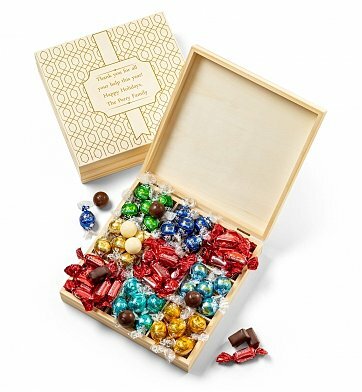 Send a chocolate collection that's sure to be savored, shared and remembered, especially when it arrives in this exclusive personalized gift box. Your own chosen message is engraved on the crate's lid, making it a memorable keepsake gift. Exclusive Chocolate Pomegranate Truffle Cremes. 30 Lindor Truffles in Milk Chocolate, Raspberry, Caramel and more. Each gourmet item is carefully assembled, and the gift arrives presentation-ready. A free card is included with your personal message or greeting. Free Engraving! Complete the personalization option at checkout and we'll engrave your chosen message on the lid of this keepsake crate. Up to four lines with up to 20 characters. Measures 9" x 9" x 3". Personalized Chocolate Box is a hand delivered gift. These gifts are delivered by one of our local design centers located throughout the United States and Canada. Same day delivery is available for most gifts when ordered before the cutoff time. The cutoff time for Personalized Chocolate Box is 2 PM in the recipient's time zone. Arrives in a keepsake gift box bearing your chosen engraved message. Filled with chocolates and Lindor truffles in many assorted flavors. This was a thank you gift delivered to a hospital for unit staff, not addressed to a particular individual. I can only trust that it reached its intended nursing unit as delivery was made to the hospital. My online ordering experience was excellent with timely follow up regarding delivery.